We continue to grow at a rapid pace and are always looking for new talent! We are hiring in New York and Los Angeles! We occasionally need hosts in Dallas as well so feel free to submit your audition if you live near any of these areas! Working for this team is not only fun but we pay well and schedules are extremely flexible. Please submit your audition by following the instructions below. We look forward to seeing your talent! 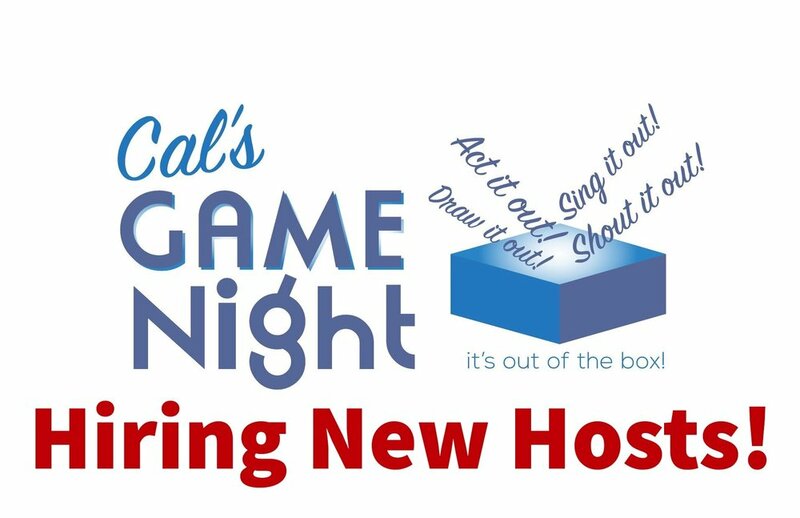 First tell us about yourself, where you are from, what you do, why you think you’d make a great game host and why you want to work for Cal’s Game Night. You can choose what to talk about these are just suggestions. The point of this is for us to get to know you. Trust is one of the most important things when working for this company. Explain what makes you a trustworthy person. Choose a game of your choice and explain it to us as if we have never played before. You don’t have to be super creative or clever, we just want to hear that you can clearly explain a game with the rules in a timely fashion. This does not have to be a game specific to Cal’s Game Night, it can literally be any game. We should just clearly understand the rules and how the game is played by the time you are finished. Deliver the opening to Cal’s Game Night and explain the first game. A script has been provided below. Please do not follow this word for word, this is a guide! Put your own personal spin on it, the details and meat of the introduction should all still be there but make it your own. We have an immediate need for more game hosts as our business is rapidly growing. This is a part time side gig and not meant to be a full time job. This is a great way to make good money on the side and is fun work! We have many high profile clients and many regular customers. We are looking for not only performers but those who understand giving the highest level of customer service to all our clients. Are you typically available on weekends and evenings to work game events? You will be responsible for getting yourself to the event, do you have a car and understand your payment includes the cost of getting yourself to and from the event? Hello and welcome to Cal’s Game Night! Here is how this evening is going to work. We are going to play a few different games and for each game you will be on different teams. In between each game there will be a 5 minute break which will allow you to use the restroom and/or get another drink and then we will meet back here to go over the next game. During that break we will be putting in the scores for the teams that won and dealing out new teams for the next game. By the end of the evening we will have individual 1st, 2nd and 3rd place winners and there are prizes! When we finish going over the rules for the first game you will go over to our Cal’s Game Night home base and see what team you are on and head to those rooms. The four rooms are the dining room, the living room, the piano room and the TV room. Please do not take your name card or you will not get points when we go to give your team points. The card is just there to tell you what room you will be heading to for the first game. The first game we will be playing is Running Charades! Each team will decide who is going to go first, that person will come to me and get your first clue for example *(pick a movie or TV show)*. Then each person from their team will run back to and act out the clue with classic charades rules; we will go over charades rules in just a minute. Whomever on your team guesses the answer correctly runs back to me and gives me that answer, then I will give them the next clue. The first team to get through all ten clues and figure out the theme will win. An example of a theme would be if I said, The Lion King, Beauty & The Beast, The Lion King, Cinderella (Disney movies!). If you get the theme early that’s great but to win you must get all 10 clues and the theme to win! Ok everyone go see what room your team is in and head to that room!